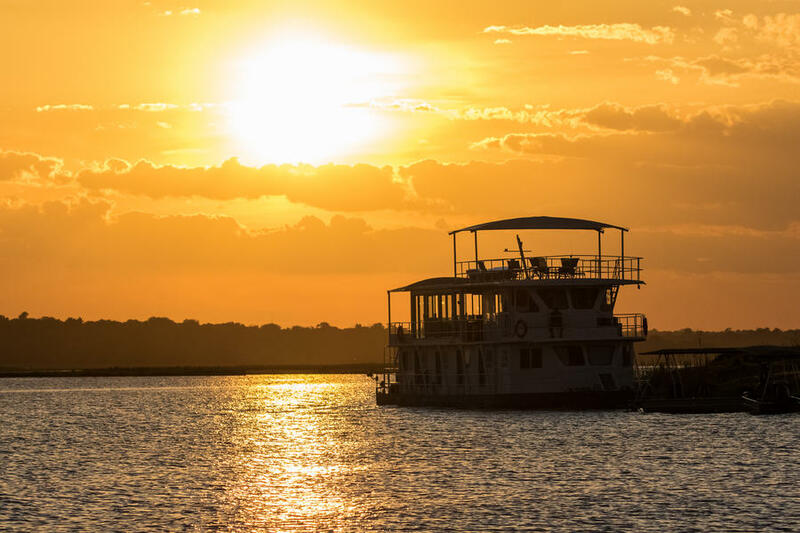 (*) As there are only 5 rooms on the houseboat, everyone will be sharing a room on the boat (4 nights), but there will be a single room available at the safari lodge (6 nights) for single travelers. 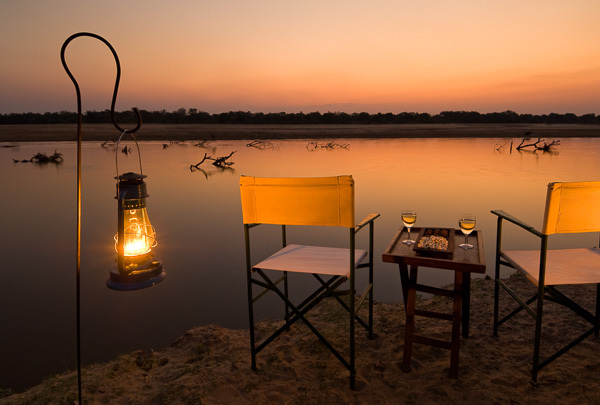 Botswana and Zambia are famous when it comes to high quality safari tourism: small camps, luxurious accommodation, superb wining and dining, so what more do you want? Oh right, ABUNDANT WILDLIFE! 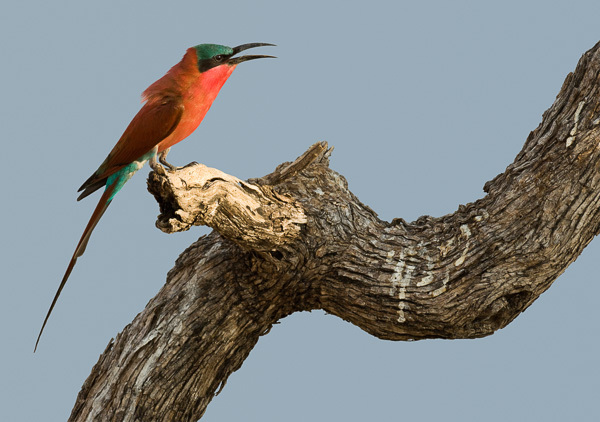 We’ve come up with another unique tour in Botswana and Zambia, offering photographic opportunities from boats and from land. 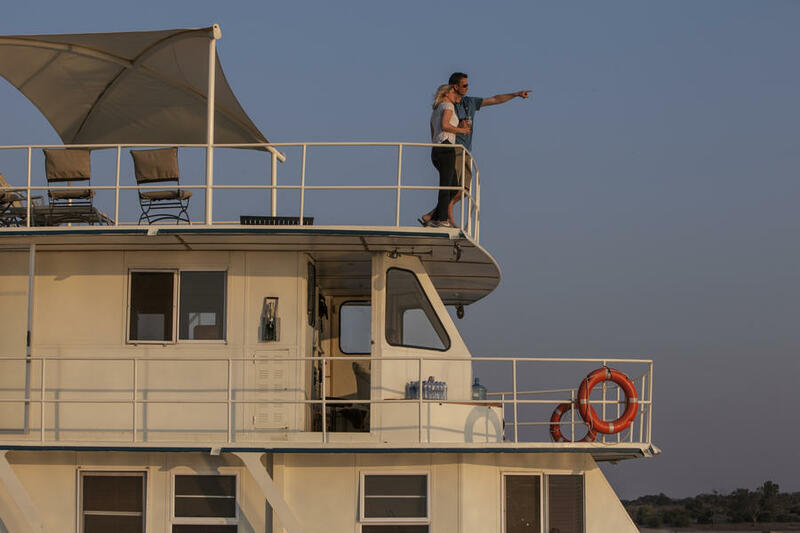 You will spend the first section of the safari (4 nights) on board a houseboat, where we will use two seperate docking locations along the Chobe River. 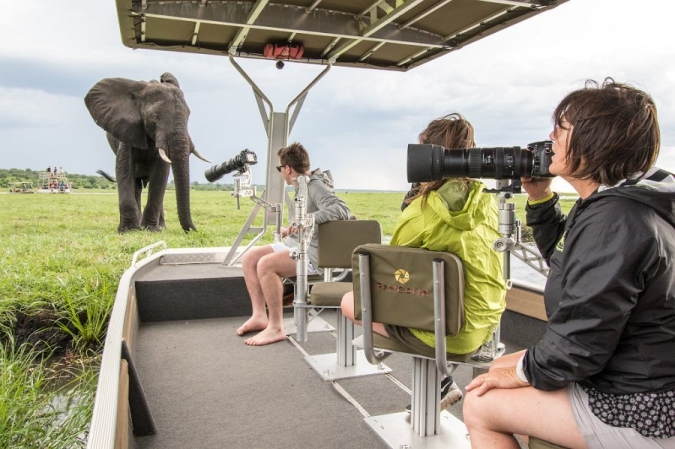 And from there we use a small but very stable photography boat to shoot from and go to wherever the wildlife takes us! 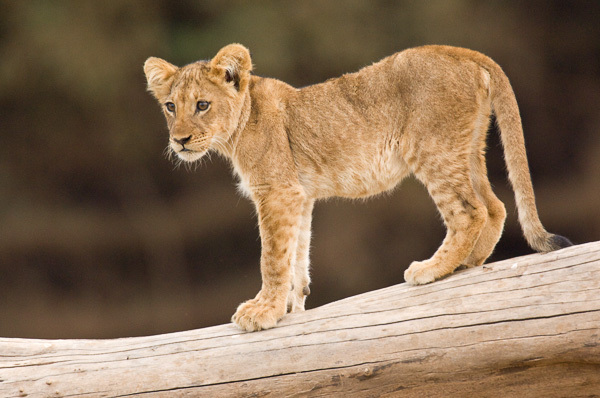 This river safari is followed by a stay in our private tented camp in Puku Ridge in South Luangwa (6 nights). Both the houseboat and the camp will be privately used by our group, so we have maximum flexibility in our program. Everything on this tour has been designed by and for photographers. We shoot from specially designed photographic boats and have 3 private vehicles for our group, so everyone has their own row of seats. All is done to get you the best photographic opportunities! 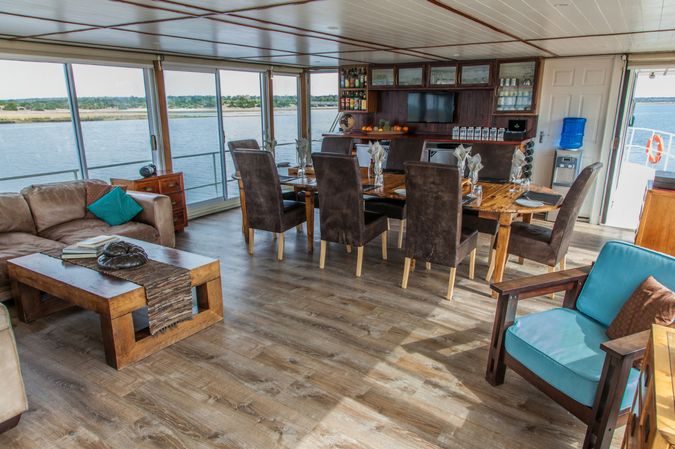 We will spend the first 4 nights on the Chobe River, on board a charming houseboat. 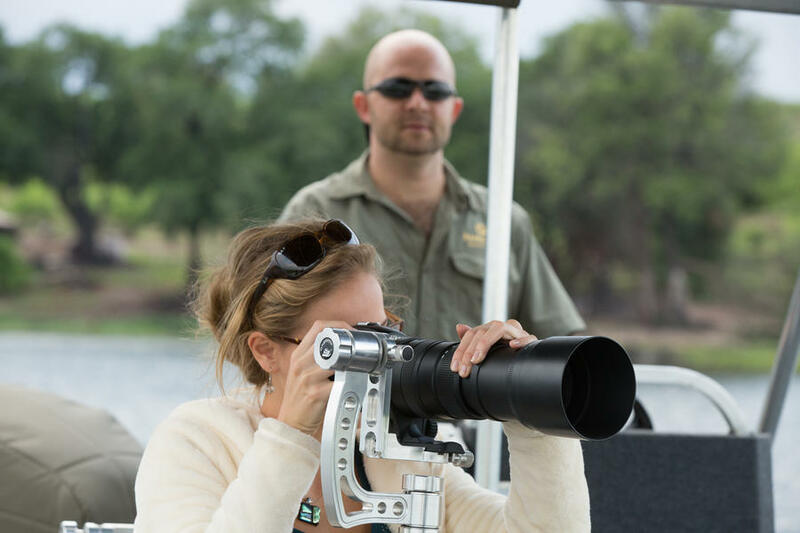 The Chobe River is probably one of the best waterways for wildlife photography on the African continent. Fed by waters from the Angolan highlands the size of the river very much depends on the season, and it’s at its fullest during the middle of the year. Close to Kasane, the river merges with the iconic Zambezi River which then travels a further 70kms to plunge over the mighty Victoria Falls. The Chobe has one very rare characteristic in that at certain times of flood the water from the Zambezi will prove to be so powerful that it will cause the Chobe to reverse its flow for a month or two. 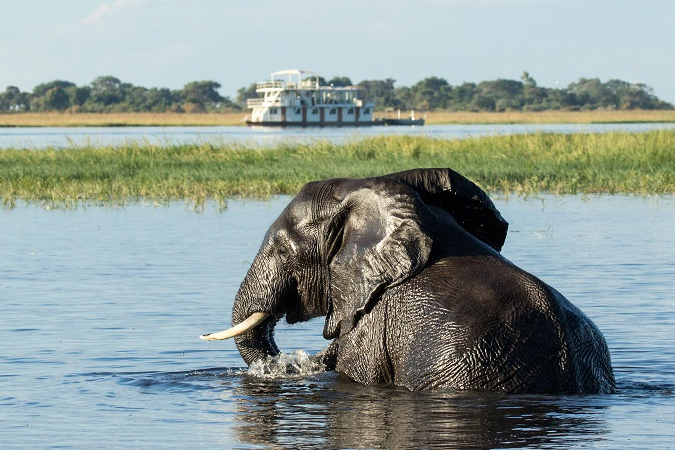 The Chobe River is famous for its elephant populations and it’s not unusual to see several large herds congregating and even swimming across throughout the day. The boat is spread over three levels affording plenty of space for our group. 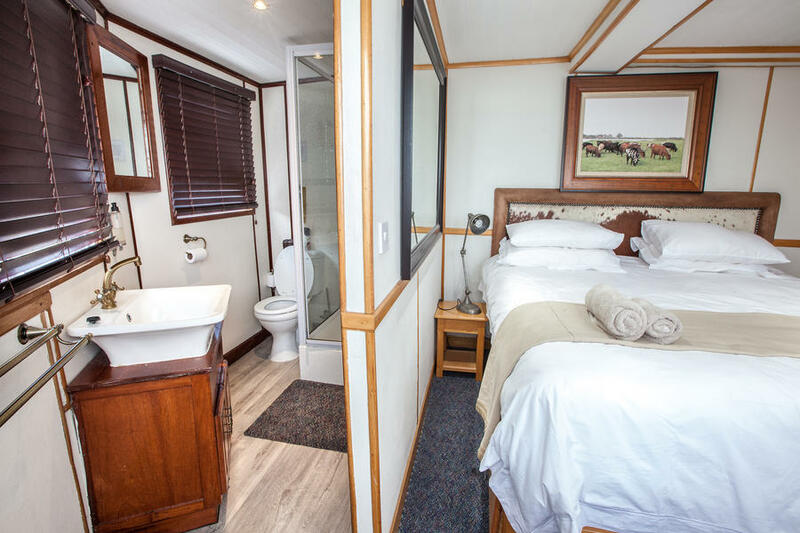 On the lower level, the houseboat has five well appointed en-suite cabins with double or twin beds (depending on the required configuration). The cabins have built-in cupboards, air conditioning (during times the generator is running) and the windows are fitted with mosquito nets to allow the gentle breeze from the river and the nighttime sounds of the Chobe River to pass through the rooms. The most exciting part of this trip is how we photograph the animals we see along the river! 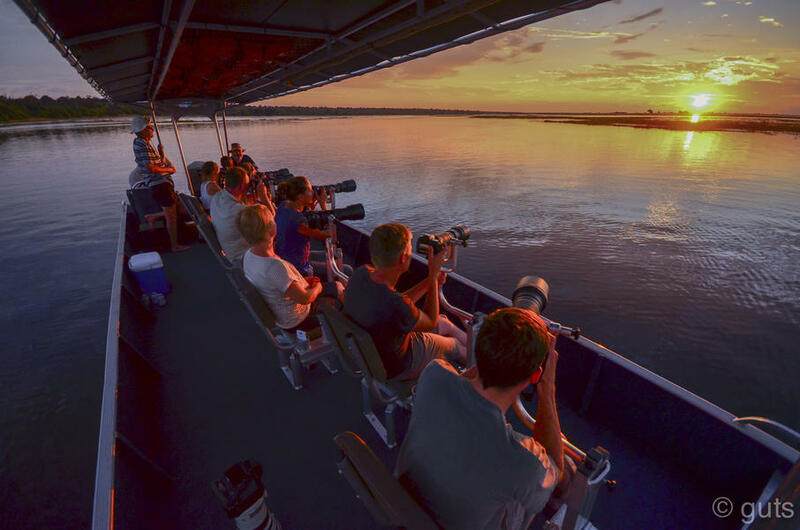 The game viewing on the houseboat is done from a small photo boat with eight custom built photo chairs. The chairs are equipped with camera mounts and are able to rotate 360 degrees. The boat is designed in such a way that there are no obstructions by poles or people. We will all sit behind one another. All chairs are equipped with a gimbal head that is adjustable in height, so both tall and vertically challenged people can photograph without getting a hernia. You will be supplied with a base plate to attach to your lens collar, which will allow you to mount your camera onto the photo boat gimbals. The plates have a quick release system, so you can quickly take the camera off the gimbal, should you want to shoot from a lower angle or handheld. We leave the houseboat at dawn to spend time on the river looking for game. We return to the houseboat for brunch where we then set off to cruise along the river to the next mooring point. After brunch there is time to relax on the sundeck and enjoy the view or work on the images you took that morning. In the mid afternoon high tea will be served on the middle deck consisting of sweet and savoury dishes before we head out again on the river for game viewing. The game activities end at sunset when you will return to the boat and get ready for dinner which is again served on the middle deck. A transfer on the water will bring us back to Kasane and a private air charter will take us to Mfuwe in Zambia, which is the gateway to South Luangwa National Park. For scenery, variety and density of animals, South Luangwa National Park is one of the best parks in Zambia, if not Africa. 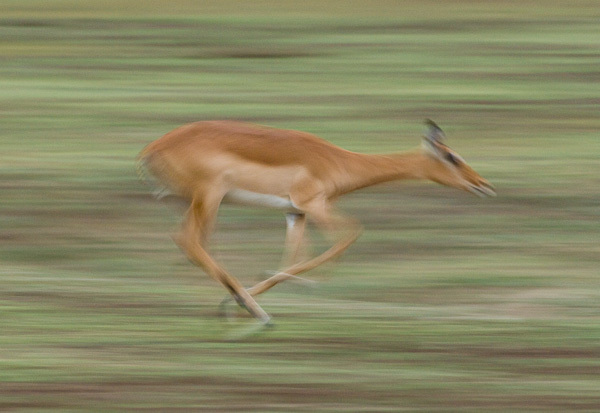 Impalas, pukus, waterbucks, giraffes and buffaloes wander on the wide-open plains. 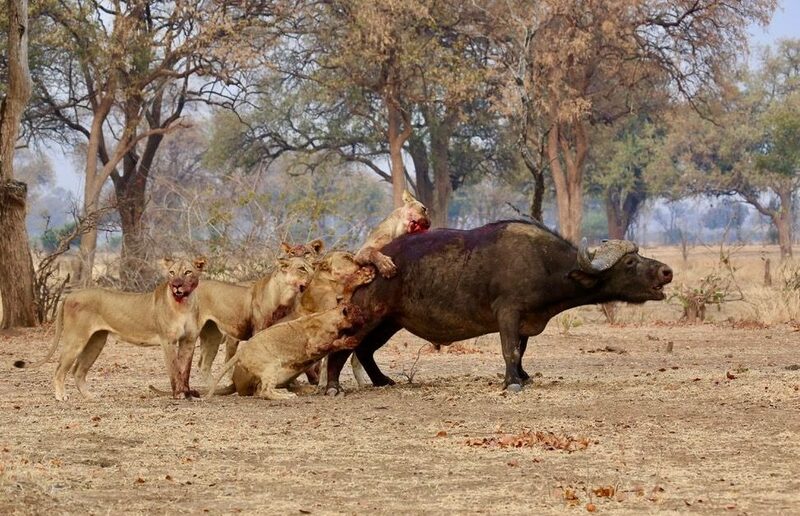 Leopards, of which there are many in the park, hunt in the dense woodlands, herds of elephants wade through the marshes, and hippos munch serenely on Nile cabbage in the Luangwa River. 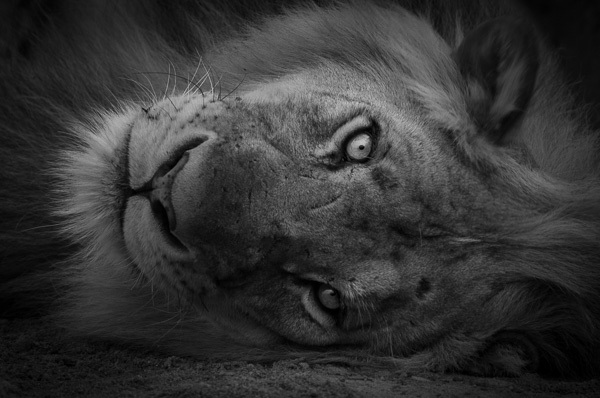 Lions are also relatively common. 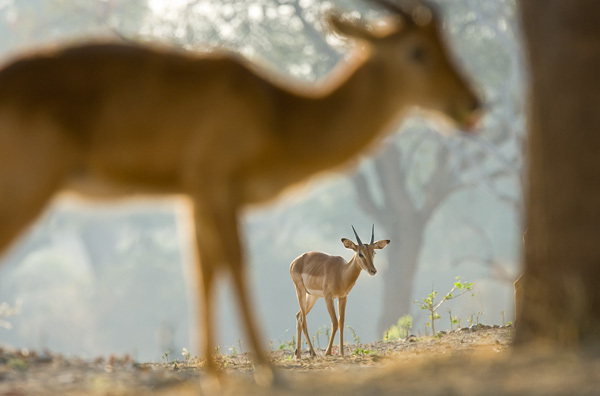 But there is more to South Luangwa than these safari icons. It is also home to the endangered African wild dog, 14 species of antelope and endemic subspecies including the Thornicroft’s giraffe and Crawshay’s zebra. Large sections of South Luangwa have little undergrowth, which makes photography here much better than in a lot of other Southern African parks. The lodge we selected is located just south of an area that is considered the heart of South Luangwa National Park (accessible through Mfuwe Gate), where the majority of the lodges in the park are situated. At the moment Puku Ridge is being renovated and will be run by the same people who are in charge of running Chiawa and Old Mondoro. We have been visiting and going to these two lodges for many years now and knowing that the same people will be behind Puku Ridge is a guarantee for success. The camp is going to be gorgeous and its location in a prime Luangwa spot is incredible. The camp has 8 tents, fully ensuite indoor and outdoor showers, bath, star bed and a private plunge pool overlooking “Puku Lagoon”. The hillside that is home to the remote tented camp provides astounding panoramic views of the Kakumbi Dambo floodplain, located in a private area of the South Luangwa NP. The area where we are in is less busy with vehicles, as most visitors will be doing their game drives further north. But the area is still just as productive with regards to wildlife. We are offering you the best of both worlds! For game drives we will have three game drive vehicles in the camp. This leaves plenty of room for photo gear and gives maximum maneuverability. For those of you who like to get off the vehicle and walk around, we offer walking safaris from the camp. This is a great opportunity to learn more about the tracks and trails left by the animals we’ve been photographing. A private charter will take us to Lusaka which has excellent daily connections throughout the region. If you are interested, you can extend your stay with a few more days in the Lower Zambezi or South Africa, which we can set up for you. We have made our reservation based on exclusive use of the camp for 6 nights. This way we can be totally flexibile: our schedule is their schedule. And we can ensure you the best photographic opportunities, making the trip so much more enjoyable being with just our group in camp. All single travelers will have to share a room on the house boat with someone (as we have only 5 rooms on board). But Puku Ridge should hae ample rooms to give single travelers their own room. The single supplement is just 900 USD. Images on this page from the house boat have been provided to us. 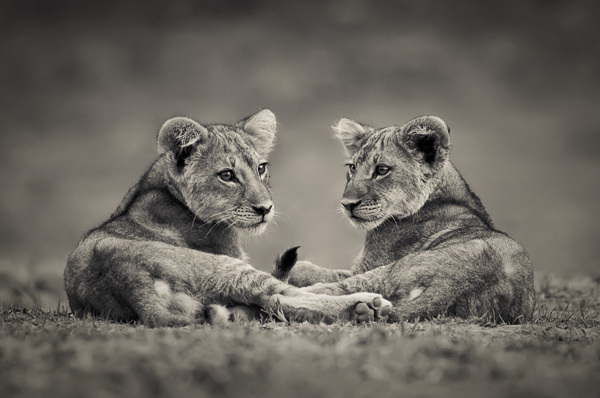 The images from the land-based safaris are shot by the lodge manager and Marsel.